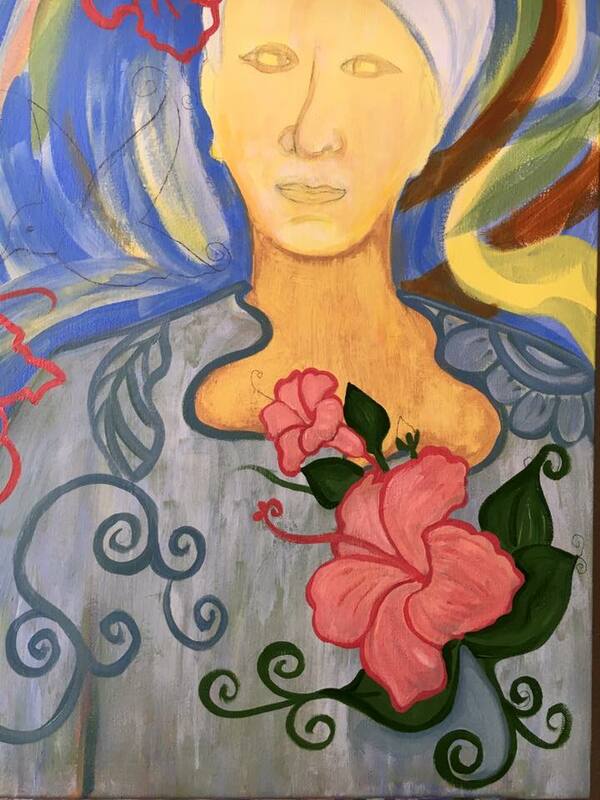 This is the beginning stages of a self portrait, response to cancer. Three months after moving from Colorado Springs back to my home in Seattle, I awake and think of the blog posts I wrote during by dark battle during IV chemo. Part of me wants to stay far from even thinking about those hard days, but part of me knows I need to remember and release trauma associated with those days. The ways I’ve been releasing the trauma so far – walking an hour each day, trying yoga and adding stretching to my daily regimen of self care, talking with God about the hard, darkness of IV chemo and utter fatigue, and now….painting a painting to respond to cancer. Showing that cancer is hard and scary, is one thing I want to show in this painting. I also want to bring grace and beauty out of this suffering and into the piece. I am combining mehndi art forms and realism. I’m also remembering beautiful places where I have been, where lovely people live. There are hints of Nicaragua, Peru, Italy, India, Cambodia, and even Africa. I have a PET scan and CT scan on August first. My body will be scrutinized for cancer cells hiding here and there. I am praying there are fewer cells wandering around, and I am hopeful my immune system has become stronger. I’ll continue painting and telling my story, and God’s story in the midst of it, as long as I can. In my living room, I have a large canvas of African dancers. I call the painting, “Joy.” This painting in my living room encourages me every single day. It reminds me to ponder all my blessings, and the one true God who gives those blessings. I can so easily get sidetracked by my daily concerns, my cancer, my oxygen tubing and its limitations, and so many other little details of my life. Then, there hangs that painting, preaching a sermon of encouragement to my anxious heart. I find myself letting go of my cares as I soak in the colors and movement. make a beautiful noise to the Eternal, all the earth. enter into His presence singing songs of joy! Know this: the Eternal One Himself is the True God. we are His people, like sheep grazing in His fields. walk through His courts, giving praise. Offer Him your gratitude and praise His holy name. and His truth will last throughout all generations. Psalm 100, The Voice version. How did the painting come about? Well, when I was in Cameroon helping women to share their stories using art, as the stories were being told and each woman received prayer, the Cameroonian women would break out in joyful singing and dancing. It was an amazing experience to be a part of, and my soul still “sings” when I think of those days of joy. I came home and painted this painting! So, when I feel down about fighting stage four cancer, when I ache all over and struggle to feed myself, huffing and puffing from the effort, I remember the joy of those women through my painting. I reach out for that joy. And, I offer God praise for His goodness and mercy in my life. It might be just a moment in my day. However, there it is – a bit of redemption right at that moment, and God is glorified. Surprisingly, when my pastor, Hilario, his wife, Lois, and my second daughter, Katie, sat with me today to map out a memorial service, after my departure, I felt a weight had been lifted. Yes, I cried my way through some of it – I hate leaving loved ones. Truly, I love my people and wish never to say goodbye. However, before I knew it, I was laughing at the idea of joy and celebration (with Indian and Italian food and festive international flags) being the over-arching feelings during the service. Additionally, I sat with profound gratitude that these three dear ones would take the time from full and rich lives to do the hard work of helping me prepare my own memorial service. It was actually fun reviewing Scripture I wanted my two older grandsons to read. I could just picture them, taking a break from Legos, snacks, and their Seahawks shirts, only to don their khaki pants and nice shirts to honor their Gigi. They are both about to be baptized, so I know the Words they read will mean something important to their hearts. Those who gather that day will hear that “I have been crucified with Christ; it’s no longer I who live, but Christ who lives in me…and, there is no longer any condemnation for Marcia because she is safely in Jesus – right into eternity.” Marcia has Jesus as her Rock and her redeemer for this life and the next. My young grandchildren will lead my people into these truths. Katie with her boys – my grandsons! My friend, Judy, calls my departure, “Going Off Planet.” My friend, Gretchen, has reminded me, more than once, that when we get to Heaven, we will see that life on earth has been living in the low-rent district in contrast to the speech-defying beauty, goodness and glory we will be a part of in an Eternity with Jesus. By me remembering these sort-of jokes, coupled with my cancer, I am helped to press on in making my final plans. I think we long to not die, on planet earth because, aside from the unknowingness of it all and the lack of control we possess over dying, I think there is a part of us, deep in our souls, that remembers the Big Story and how life was in our first Garden, our Home. There really was a beginning point in time when there was no death. Somehow, we know. There was just beauty, fearlessness, a vibrant garden, a totally transparent, loving couple, a tree filled with life, and rich community with God. However, the enemy of our souls snuck into our perfect Home and snarled, lied (God’s holding out on you), robbed and darn near destroyed us and everything around us. I think, we have this deep, unfulfilled longing for that Home. An angst. I’m just saying it’s there. So, I got to do some planning today – important planning. As I was encouraging Pastor Hilario to really preach the Gospel during the service, my heart was gripped, my tears flowing, because my passion since nineteen years of age has been: there is a God, He faithfully loves you and me, He proved it by coming to earth as God with skin on – Jesus. He lived a perfect life. He died in our places for our evil thoughts, words, deeds. We can be forgiven for all our just plain darknesses of hearts and for believing that first lie that God was holding out on us. How? If we turn from trying to find Home apart from God and run to Him. I want Pastor Hilario to be sure to let everyone know; we are given Jesus’ righteousness when we run to Him, when we reach past our doubts and faint remembering of Eden. When we run and reach out to Jesus, and HIS palpable love, in faith, then Eden, Home is won back in our hearts. It’s a gift – a gift of being eternally Home with God. And that is where I will be when the celebration of my life happens. One song I hope to have at my memorial service: Give Me Jesus, by Fernando Ortega. For he chose us in him before the creation of the world to be holy and blameless in his sight…In love… (Ephesians, chapter 1) Using bubble wrap for texture. This past week, my friend, Judy, chose to come and help me during my seventh chemo infusion. She and I laughed and cried, watched movies, discussed books, listened to sermons online, ate good food, bemoaned American politics and extended grace to each other each day. She was wonderfully encouraging, and I worked past my crabbiness, from chemo, to try to be kind and grace-filled. Being sick is no excuse to be unkind. I’m intensional about that, because I want to see if my faith, and thus grace, can be certain in the dark and hard parts of my story. I am working on a new painting, which Judy had to tuck away for me during my hardest days; I was too weak and nauseous to paint. This painting started with an idea a pastor, Jason, gave me. He would like me to paint: Creation, The Fall, Redemption and Consummation or Heaven. He’d like 4 paintings, or perhaps, one painting with all four concepts. I really like his idea for a painting. I took a canvas to practice on, so this is my first practice piece. I decided to begin painting some textures that might suggest a time even before creation. Then, I added the tree to suggest the dawn of created earth within time. I am still working on the tree, and I hope to add new textures for the leaves, etc. I’ll have some realism and some abstraction. Just like life! I am using the sun to represent grace, something God provided before our time began(see Ephesians 1) and something He provides, in Jesus, moving forward in history – even during the Fall, and even in our own personal dark times. I am adding layer upon layer, just like layers of amazing grace. The second part of the painting represents the darkness of The Fall, and, on a personal level, our separation from God because of our own evil hearts. As Kathy Keller has stated above, our own hearts need grace, redemption and healing constantly, and in new places. I have marveled at the areas of pride, self-absorption, and self-pity I have spotted with the Lord as I lie quietly in bed, recovering from yet another chemo treatment. God and I tussle over who is God, I tear up and repent. I’ll have a flash of a thought of someone who was cruel to me, and my unkind thoughts in return unnerve and sadden me. I repent and ask God for mercy, forgiveness and freedom from that judgement. While lying still. Maybe that’s why we have the “Be still and know I am God.” verse in the Bible. Here you can see the contrast of the Creation and The Fall more clearly, and yet, I am suggesting that grace and forgiveness is available in the darkness – in Jesus. Because He came, took the punishment for our evil hearts, rose from the dead, and is preparing a place for us in Heaven, we can ask to have Him as our Savior and receive grace, forgiveness and freedom. We can never work our way into absolute goodness on our own, nor can we attain perfection or nirvana and master all our shortcomings or wicked thoughts. We aren’t being honest about our hearts or realistic, if we think this way. And, gosh, Jesus, His love, His forgiveness is free in exchange with our authentic repentance from our wrongs and acceptance of His free gift. Well, free to us, costly to Him. Why wouldn’t we take that gift of GRACE? I am so thankful for God’s grace – His unmerited favor, since before time and all the way forward into eternity. And, I’m with Kathy and her assessment of my heart, and the endless need of grace we have and then can receive, in Jesus, for healing and redeeming our hearts.